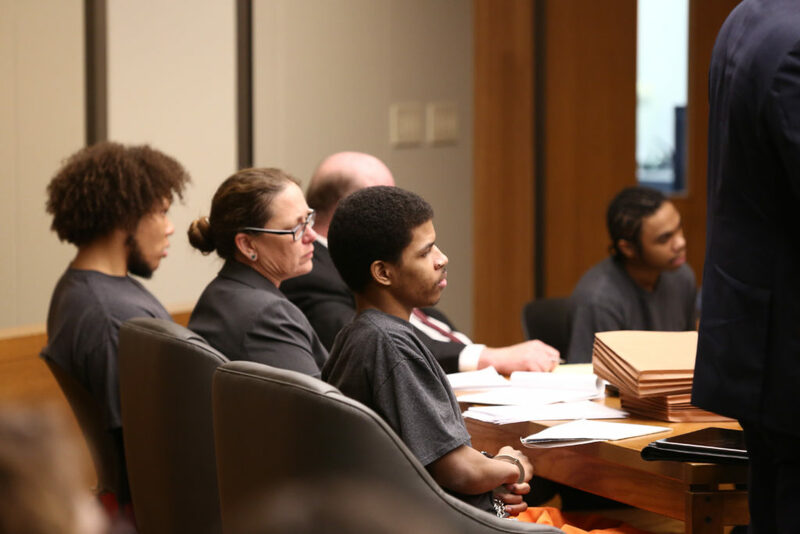 The three men charged in an October 2017 triple homicide on Massachusetts Street — from left, Anthony L. Roberts Jr., Ahmad M. Rayton and Dominique J. McMillon — listen to testimony Friday, Jan. 19, 2018, during the second day of a preliminary hearing. Seated between Roberts and Rayton is Roberts' attorney, Jennifer Chaffee. What was supposed to have been a single trial that would have been over in two weeks has now turned into three trials that will take until late April to resolve. 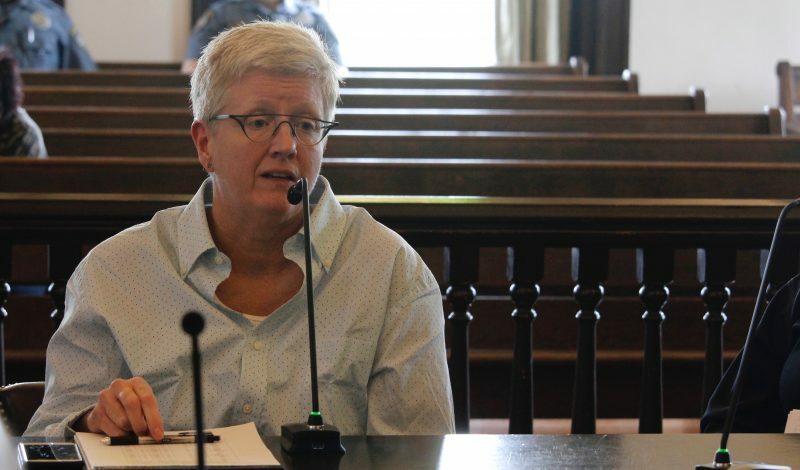 After abruptly declaring a mistrial in the downtown Lawrence triple murder case Thursday afternoon — four days into the jury selection process — Judge Sally Pokorny on Friday ordered the three co-defendants split up. Their new trial dates are in February, March and April. The move was a blow to the mother of homicide victim Leah Brown, 22, of Shawnee. At the same time, Brown and her family said they didn’t want a trial to go forward if it would have been fraught with problems. It needs to be handled right, said Leah Brown’s aunt, Jennifer Olson, of Kansas City, Mo. “The patience that that requires and the heartbreak that that requires is something that we are willing to endure,” Olson said. Leah Brown had come to Lawrence with a friend and had just left Brothers Bar and Grill, 1105 Massachusetts St., when she was hit and killed by gunfire around 1:40 a.m. on Oct. 1, 2017. About 20 gunshots followed a fist fight at the corner of 11th and Massachusetts streets, instigated by feuding groups of men from Topeka. Two Topeka men also were killed, 20-year-old Colwin Lynn Henderson III and 24-year-old Tre’Mel Dupree Dean-Rayton. Two more Topeka men were shot but survived. Three Topeka men face criminal charges in the incident and will now be tried separately instead of jointly. • Anthony L. Roberts Jr., 21, is accused of all three homicides. He faces two counts of first-degree felony murder, one count of second-degree murder and one count of attempted second-degree murder. Roberts’ new trial date is Feb. 4. He remains jailed on $1 million bond. 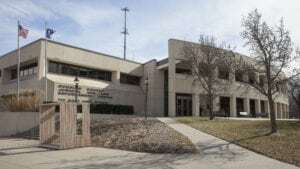 Roberts’ attorney, Topeka-based Jennifer Chaffee, has requested a pretrial hearing to argue that his charges should be dismissed because he acted in self-defense under Kansas law. That hearing is set for Jan. 31. • Ahmad M. Rayton, 23, is charged with two counts of attempted second-degree murder and one count of being a felon in possession of a firearm. Rayton’s new trial date is April 8. He also remains jailed on $1 million bond. Michael Clarke is Rayton’s appointed attorney. • Dominique J. McMillon, 20, is charged with aggravated assault, a felony, and battery, a misdemeanor. McMillon’s new trial date is March 18. Alone, his trial is expected to take less than a week, unlike the others still scheduled to last two weeks. McMillon has been jailed on $25,000 bond. His appointed attorney, J.C. Gilroy, has now requested a personal recognizance bond, saying his client has been in custody close to the time he’d be sentenced if convicted for his low-level charges. Neither the judge nor any of the attorneys have publicly shared the specific reason for the mistrial, other than describing it as a legal matter. Pokorny sent the Journal-World an emailed statement on Friday afternoon. The mistrial occurred while Roberts’ attorney was talking to potential jurors. At least one juror afterward described that portion as rocky, including misstatements by Chaffee and numerous objections by the DA that were sustained by the judge. After a meeting with attorneys in her office, Pokorny returned to the courtroom, announced the mistrial and sent all the potential jurors home. Clarke and Gilroy had asked for their clients to have separate trials prior to this week, and they asked again Friday morning. This time, that request was granted. However, neither Clarke nor Gilroy talked about Thursday’s mistrial in their requests in open court. They cited other concerns. “In hindsight, it seems to me that there were many things that came into play that made this trial problematic,” Clarke said. Clarke said splitting the trials would keep them shorter and minimize potential jurors cut because of hardships. Specifically Clarke said that having more black jurors would help Rayton, who is black, get a fair trial, but in this case most of the black jurors in the initial pool were released because they said they couldn’t afford to leave hourly jobs for more than two weeks. Clarke said the added security measures for the three-defendant trial — namely a metal detector added outside the courtroom door to block cellphones from getting in — also could negatively affect potential jurors’ perception of his client. Gilroy, whose client, McMillon, also is black, agreed. Gilroy also emphasized that most witnesses at the group trial would be irrelevant to McMillon’s far less serious charges, but they could unfairly reflect on him. “It’s just going to have a highly prejudicial effect,” Gilroy said. Prosecutors still pushed for a joined trial. Branson said the law doesn’t require the jury to have a specific racial makeup. He noted that one of the released black potential jurors was a student and another wasn’t an hourly worker but a small-business owner. Pokorny said that after reflecting, she saw the potential for prejudice to McMillon in particular. Also, she said, in some ways individual trials would actually be more efficient. Regardless of when those trials happen, Gretchen Brown said she doesn’t see trial verdicts as “justice,” a word she said others often use. Brown said guilty verdicts also would send a message to the Lawrence community that violence doesn’t belong here. An emergency room nurse at the University of Kansas hospital, Brown said she has seen shooting victims from, among other places, Kansas City’s Westport entertainment district. She said her daughter and her friend had thought about going there the night of the shootings but opted for Lawrence.